First up, the winner of yesterday's mini giveaway is Jana from Jeweled Tips! Congratulations Jana, and enjoy your China Glaze Mistletoe Kisses. 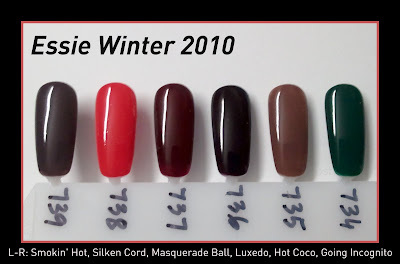 Here's a first look at swatches from Essie's soon to be released Winter 2010 Collection. Their web site is showing a November 1 release date, so these will be available very soon! (Click photo to enlarge). Yen from VNS sent this photo over to me, and after looking at an ad in Nails Magazine for this collection and comparing the shades to this photo, they look to be fairly close. The photo above may show Going Incognito as just slightly darker than the ad photo, but just slightly. Some photos I've seen of the bottles (promo pictures) show Going Incognito as a little lighter with a possible hint of blue or teal mixed in, but the ad I'm looking at and this photo show a more forest green (Orly Enchanted Forest-ish?). It's described by Essie as a "deep emerald". These appear to be creme finishes, but Demure Vixen from the Summer 2010 Collection looked more like a creme in promo pictures and that one turned out to have a very subtle shimmer. Hopefully we'll start seeing some swatches on nails of this collection soon, so we can plot and plan! With Sephora's F & F coming up at the end of this week, followed by the Rescue Beauty Lounge sale November 1, decisions need to be made so we can keep our budget in line! going incognito is really pretty! These look really nice! I can't wait to see actual nail swatches. None of these ar actually grabbing my attention, even the green! Maybe if I see them on the nails I'll change my mind. Smokin' Hot looks awesome. I will most likely be getting that one. I hope there's lots of dupes here. I have a big order from Zoya coming! Congratulations to Jana for winning the giveaway. my leetle nails~I'm always curious about greens, so definitely looking forward to this. Hoping it's a little more than just a straight forest green. Zara~I know, it's hard to really judge them until you see several swatches on the nail! ABCnails~that's always my first thought when I see a dark green...is it a Zula dupe? Ha-Ha, we'll find out soon. Aurora's Nails~I think I'm suffering from Fall color burn-out at this point! Silken Cord looks pretty, but I love corals. Amber~I don't think it's quite as dark as it looks, but I'm not sure. I also like Hot Coco because it looks a little different than other similar shades I've seen. Jen~oh I know, very bad for the wallet! I love Essie polishes, new and old ones.